(Trent Nelson | The Salt Lake Tribune) Utah Jazz vs. Boston Celtics, NBA basketball in Salt Lake City, Wednesday March 28, 2018. Utah Jazz center Rudy Gobert (27), Utah Jazz guard Donovan Mitchell (45), and Utah Jazz guard Ricky Rubio (3) at halftime. Believe it or not, the Jazz’s season is halfway done. Quin Snyder’s team played its 41st game of the season against the Milwaukee Bucks on Monday night, a loss that pushed them down to a disappointing 20-21 record. They currently stand just tenth in the Western Conference standings. Relative to last season, it’s an improvement. The Jazz had just a 17-24 record last year at this time, and ended up bottoming out at 19-28 before surging back into the playoff picture with a scintillating run. But past performance doesn’t necessarily predict future results: In 2017-18, multiple injuries to Rudy Gobert got the Jazz off to a tough start. In 2018-19, they’ve been largely healthy in the first half of the year, though the second half of the year already portends trouble in that category, thanks to injuries to Ricky Rubio, Dante Exum, and Thabo Sefolosha in the last week. And the Western Conference landscape has changed, too. There are more realistic contenders fighting for those playoff spots, and only one truly bad team — the Phoenix Suns in the entire West this year. But the schedule does indicate brighter days are ahead. The Jazz have the easiest schedule in the Western Conference remaining, and most prediction systems that take that into account have Utah as roughly 90 percent favorites to make the playoffs this year too, even playing only as well as they did in the up-and-down first half. Regardless of what you believe is to come, the halfway point is a natural time to take stock of what came before. Here are The Salt Lake Tribune’s first-half season awards for the Jazz. Rudy Gobert hasn’t had a flawless start to the season: his up-and-down defensive efforts early in the year were a large part of a surprisingly average defense in the first 15 games or so. But after a few weeks of caution, Gobert figured out that he could, in fact, play defense on the perimeter on stretch bigs and still protect the paint. Now, the Jazz are back up to fifth in the league defensively; if you took just the portions of the game when Gobert was on the court, they’d rank 2nd. Meanwhile, Gobert’s offense has continued to improve, as he leads the league in field goal percentage and is still on pace to set an NBA record in dunks. It seems like so long ago now, but Grayson Allen had an extremely impressive preseason for the Jazz, scoring 13 points a game while showing off a quick and accurate trigger from outside. 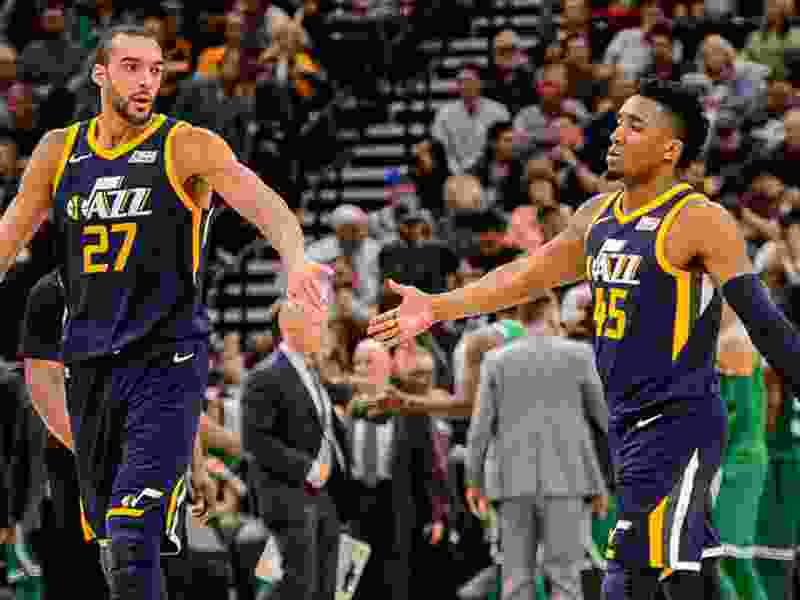 But when the regular season came, Allen’s defense proved to be essentially unplayable: when he was on the court, the Jazz had a 114 defensive rating and were outscored by 15 points per 100 possessions. His minutes quickly evaporated, and he’s played six good-but-not-standout games with the G-League Salt Lake City Stars. More recently, an ankle sprain has sidelined him from even that. Allen’s still a rookie, but at 23 years old already, may have less time to figure it out than, say, a 21-year-old Tony Bradley does. Derrick Favors has been in a Jazz uniform and doing these kinds of things for such a long time that his name in the “Most Improved” category might surprise you. But the truth is that, on a per-minute basis, this might just be Favors' best season: he’s scoring more efficiently than ever before and has added a sketchy-but-usable 3-point shot to his game. But the best part has been his effort on the glass, especially on the offensive side of the ball, where he’s getting offensive rebounds and putbacks in almost herculean 3-on-1 situations. Dante Exum is also a logical candidate for this award, but a very sketchy first month to the season balanced out the leap he took in the last month from an overall point of view. Jae Crowder is the obvious selection here. It’s less that he’s the sixth-man than the defacto fifth: the lineup with Ricky Rubio, Donovan Mitchell, Joe Ingles, Crowder, and Gobert still outscores teams by 15 points per 100 possessions this season, the fourth-best lineup in the NBA that’s played at least 200 minutes together. Crowder’s ability to space the floor — though he’s an inconsistent 3-point shooter — opens up space for Mitchell, Rubio, Ingles, and Gobert to do their thing, while still maintaining defensive bite on the other end. I’m not sure Jazz fans ever thought they’d see Kyle Korver in a Jazz uniform after he departed Utah in the 2010 offseason for the Chicago Bulls. But after trading Alec Burks and two second round picks for the 37-year-old, Kyle Korver’s minutes have really changed the bench unit — they’re outscoring teams by 6.5 points per 100 possessions while Korver is on the floor. Since the trade, they have the fourth-best net rating in the NBA. A series of blowout wins and close losses has made Korver feel less impactful than those numbers show, but Korver’s shooting threat has changed the Jazz’s bench for the better. Korver and Snyder still think they can get better together with more time to adapt, we’ll see about that in the second half of the season. Gobert has 153 dunks this season. Mitchell has 10. But I don’t know if we’ll be able to top this effort from Mitchell, who catches this really difficult alley-oop pass from Crowder from half-court, then somehow finds the basket in mid-air to slam it home on Christmas Day. Necessity is sometimes the mother of invention, and this pass probably wasn’t planned to happen like it did for Rubio. But stuck in the air, Rubio somehow got the ball behind his back and bounced it to Crowder, who took advantage of the trickery for a dunk against the Celtics. Gobert has had more than his fair share of blocks, but his defensive play in the Jazz’s win against the Warriors was nothing short of absurd. On this play, he has both feet outside of the 3-point line to prevent Curry from shooting, but despite a perfect cut from Draymond Green, and a perfect assist from Curry, Gobert gets back in the play to block the shot anyway. No other player in the league makes this play. There have been and will be more important shots for the Jazz this season. But nothing made us laugh quite like this Joe Ingles sequence. Up 16, a fan yells for Ingles to shoot the ball, despite being covered by Jusuf Nurkic in the corner. From the baseline angle, you can see that Ingles tells Nurkic he’s going to shoot it. And true to his word, a couple of seconds later, he does. Result of the shot: a swish. Tipoff • Wednesday, 7:00 p.m.